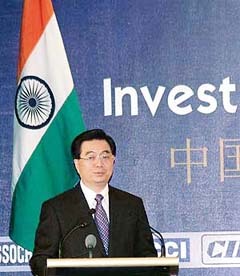 Beijing, Jan. 14: The India-China Economic, Trade and Investment Cooperation Summit began here today where Prime Minister Dr. Manmohan Singh is expected to call for greater economic engagement between the two countries. Dr. Singh is also expected to emphatically lay stress on the historic necessity for the two great neighbours to work together. While acknowledging that India suffers from a trade deficit vis-a-vis China, Dr. Singh will also highlight the fact that while there are and will be areas of competition, there are areas for cooperation. He is likely to emphasise that there is enough space in the world for both countries to continue to grow and address the developmental aspirations of their peoples. He will simultaneously urge Indian business to "think big" in the belief that Indian business is ready to face the brave new world of globalization. The summit will be followed by a press conference to be addressed by Commerce and Industry Minister Kamal Nath. In the afternoon, the Prime Minister will proceed to the Great Hall of the People for the welcome ceremony, restricted talks with Premier Wen Jiabao and delegation -level talks. The talks will be followed by the signing of five Memoranda of Understanding (MoU). There will be a press briefing thereafter. There is a possibility that during the delegation talks, China might enunciate its "support" for the Indo-US civilian nuclear deal, even as the two sides seek to move forward on the boundary issue.